If you read my previous articles set in or around The Hague, you’ll know that I’m very fond of this city and I admire all the efforts that are being taken to place it on the imaginary foodie map – whether it be thanks to a cool food tour or a hip food truck festival. When the food (truck) festivals started being popular around Europe, the Netherlands wasn’t lagging behind however most of them were located in Amsterdam. It didn’t take much time though for The Hague to catch up, and now there are a whole load of food festivals happening between April and October in the City of Peace and Justice. One of my personal favourites from last year was one called TREK (‘hungry’ in Dutch). It was held at the Westbroek Park, a stone’s throw from the Madurodam (mini-Netherlands) in a lovely green surrounding. I absolutely loved the choice of food trucks from Surinamese roll filled with a spicy stew, to the juicy pulled pork sandwich and the sneaky milk chocolate covered churros (gulp!). It was also great to see such a mixed crowd enjoying themselves with great food and drinks, and the DJs providing background music for the more outgoing ‘dancers’ after sunset. 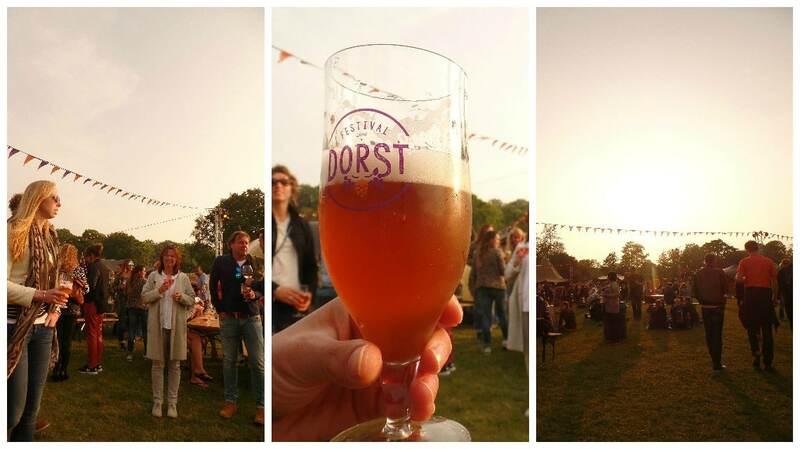 Needless to say I got giddy like a fangirl when one of my fellow Travelgluttonists mentioned that the team behind TREK is organizing a wine and beer festival, called… yes… you guessed it: DORST (‘thirsty’ in Dutch… genius!). The festival was held in the same magically green park during the last weekend of May, and they were even lucky enough not to be washed away by rain or thunder (yup, that is perfectly possible in this part of the world). As someone who frequently visits wine festivals back home, I was excited to see what the TREK/DORST posse had come up with. The organizers promised a festival where over 70 types of different beers and wines would be made available from all over the world. 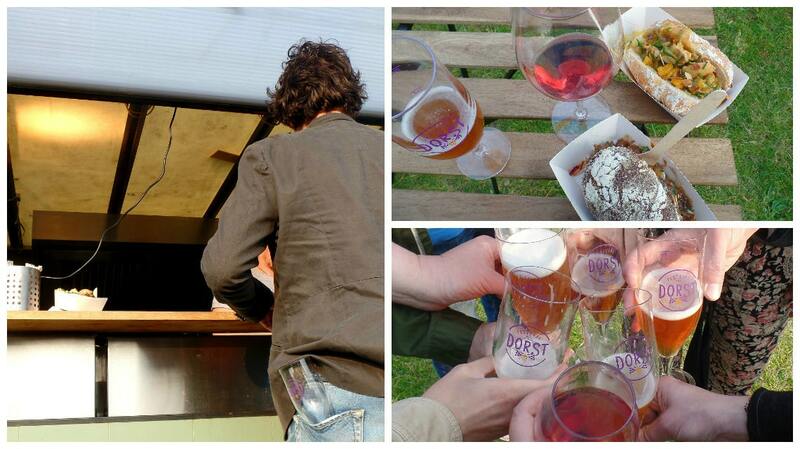 The drinks were served in separate tents with a handy logo on them so you knew where you can order just beer or wine. All of these tents had different themes such as ‘Secret Treasures’ which served wine from less well-known grapes, or ‘The Germans’ offering you the best of German and Austrian wines. I’m not a fan of beer so I grabbed a classy plastic wineglass at the entrance while my companions stuck with beer. I started off with a fresh citrusy Sancerre Blanc from France at the ‘Good Oldies’ tent and then moved onto a lovely radiant yellow-toned Riesling Feinherb from Germany. At this point ‘trek’ rather than ‘dorst’ was coming over me so I stood in line for a gourmet hot-dog (!!!). It was a great ‘dog’ (I mean it had strips of bacon as a topping! ), but it barely satisfied my appetite. So I invested in a ‘stoofvlees’ sandwich which was basically beef stew served on a crispy bun, that turned out to be a life-saver. I proceeded to explore the wine tents and ended up with a full-bodied, fruity rose from Spain at the ‘Bio-Bio’ tent (keeping it healthy!). Finally, I ended my wine-tasting ‘binge’ with a gorgeous Italian red wine called G.D. Vajra Langhe Rosso, with aromas of red fruit and plums at the ‘Secret Treasure’ tent. It paired really well with my last act of hedonism of the night: a churros covered in milk chocolate (anyone noticing a pattern here?). All in all the festival was great fun: the selections were decent although I would have loved to see less obvious choices as well such as wines from Hungary, Macedonia, Croatia. The atmosphere was very laid back: great music in the background, good food to balance out the alcohol, card systems for purchases so you don’t have to fiddle around with your purse (though 1 euro administration cost per card to get your leftover money back is cheeky to say the least). However, I was surprised and frankly disappointed by the prices: almost 6.50 euros for a hotdog (however signature it might be), over 5 euros for a little over 1 dl of wine? It looked like the prices might have kept some people away too. While I loved the diverse crowd of TREK (old and young, students, housewives, pensioners, kids etc. ), diversity was nowhere to be found here and the whole affair felt a bit too posh for me this time around. There are two more of this festival planned in the Netherlands: 26-28th August in Den Bosch and 2-4th September in Utrecht. Check it out and let me know what you think!